Send Golden Choco Flap Box to Chennai. Gifts to Chennai. Send Chocolates to Chennai. Description : Pamper the tastebuds of your dear ones in Chennai, by sending them this aesthetic golden colored chocolate flap box. 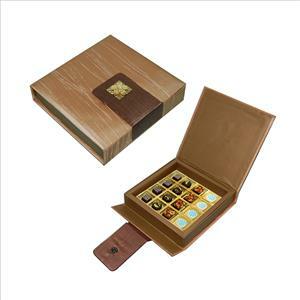 This beautifully designed box consists of 32 pieces of delectable handmade chocolates, available in four flavors. Your loved ones would defintiely be excited when they receive this beautiful box full of chocolates from the house of Krazy for Chocolates. Through the online gifting portal Gift2Chennai.com, you can easily send this box anywhere in India for your loved ones as Gifts to Chennai.